Let’s take uniformly distributed hidden shared variables as circle angles. When these variables have a constant difference between the arms, we observe a correlations phase shift by the same difference. It is a falsifiable prediction for any physical measure intended to be a representation of the shared variable compatible with this family of distributions. In order, 90 °, 45 ° and 23 °. 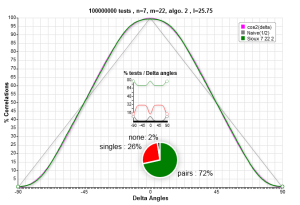 The numerical curve, called sioux on the graph, is in green and the cos² in violet. In the 3 cases, for the angles difference -80 ° , how do Alice and Bob to correlate as much? Yet, everything is random, there is just the sharing of a common variable that is used with a constant shift. If we apply a small shift over the variables 180° amplitude, for example from 2° to 10°, the curve shape is still preserved with a small degradation. The noise, got by adding a randomly positive or negative value to one of the two arms, is a kind of correlations phase shift with a zero mean.